A large gray creature inhabits Florida’s winding inland rivers, beautiful freshwater springs, and salty estuaries and bays. Is it a dolphin? A whale? Or is it a man-eating shark?! You can stop humming the music from the movie Jaws, because the theme song for this particular animal should be Donovan’s classic, “They Call Me Mellow Yellow.” This endangered marine mammal is one of the most gentle and easy going in the entire animal kingdom. If you guessed “manatee,” you are correct!If manatees were humans, they’d probably all be couch potatoes, as first on their agenda is eating and sleeping. They really have almost nothing on their schedules other than to find tasty aquatic plants on which to nibble. And they “nibble” as much as 100 pounds of plants a day!They also love to play and despite their size, manatees are very graceful in the water, executing barrel rolls, head stands, tail stands and whimsically gliding through Florida’s waters. It’s amazing to watch their antics. Harmless vegetarians, average manatees are about ten feet in length and weigh in at about 1,000 pounds. They are put together rather oddly with parts seemingly from other, more familiar animals: a paddle-shaped tail like the beaver’s; a body shaped like that of a walrus; and a snout like an elephant’s minus the trunk. Manatees are illusive because they are totally aquatic. They need to surface to breathe and most times, an observer will only see a snout at the waterline, or a tail as the animal dives. Only about 3,200 manatees are known to exist in the United States, concentrated year-round in Florida.Collisions with boats are the largest known cause of manatee deaths. It is widely agreed that one of the best ways to protect manatees is by adopting boat speed zones to slow boats in areas manatees frequent. Cold stress, toxic algae blooms, ingestion of fish hooks and other human debris, and entanglement in crab trap and monofilament fishing line also take their toll on the manatee.In 1981, Save the Manatee Club, a nonprofit advocacy group, was formed by singer/songwriter Jimmy Buffett and former Florida Governor and U.S. 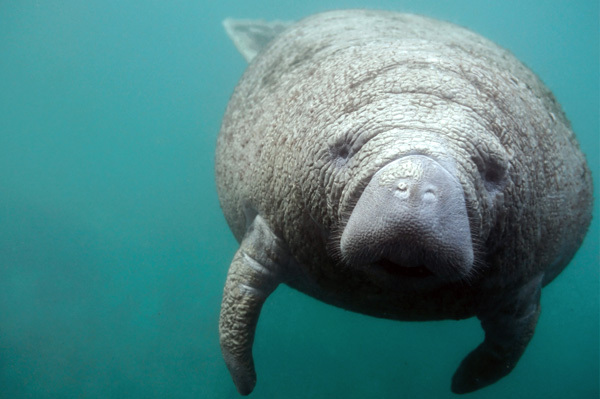 Senator Bob Graham to protect manatees for future generations. The Club sponsors three manatee adoption programs and members can follow their manatee’s progress through the organization’s newsletters. Funds raised go toward numerous conservation and education programs. Through public awareness programs, the Club has educated people from around the globe about manatees, making this species one of the most beloved marine mammals ever. You can learn more about this unique and fascinating animal at Save the Manatee Club’s educational website at savethemanatee.org. Also, you can adopt a manatee and get “up close and personal” with a known individual. It might be the beginning of a new and meaningful friendship!